All places, spiritual gathering spaces, places that host people in order to study, in the application of the gospel of Christ are good; after all they work spiritually for the glory of God and the salvation of the man. Since now in these areas were people do not judge, these places are holy. If now in these places (let’s call them spiritual schools) their members or the appointed one or the members in charge judge the others except themselves. Then the word of God among them is incomplete of love. As much as they judge they have 1) ignorance of the word of God which is O man whoever you are who judge for in whatever you judge another you condemn yourself. 2) Egoism. 3) Benefits. 4) Personal ambitions. 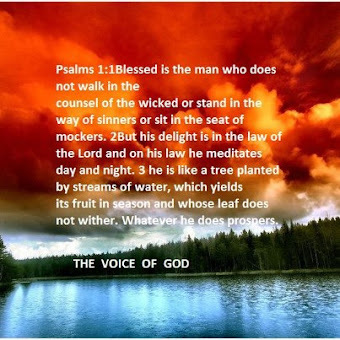 Let be aware of what we listen and on what we are admonished. Once a while we have to visit these Christian brothers. If some day will accept the admonition not to judge as well as to respect the opinion the religious conscience and the freedom of others then that will be fine. Let’s be aware if in these places there is phanaticism it is better to live them alone. I prefer to glorify God alone than among thousands of insisting incorrigible egoists and judges. I used the words egoist and judge because in the book of apocalypse is written: And the great dragon was thrown down the serpent of the old who is called the devil and Satan who deceives the whole world. Now is the salvation and the power and the kingdom of our God and the authority of His Christ have come for the accuser of our brethren has been thrown down who accuse them before our God day and night. For whom who insists not to cast out of his life the dragon (judgment) let knows sooner or later the beast will get him to burn. Amen. God has a plan! God has a way! God has love! God has unlimited power. God has all; material and spiritual goods for all people which believe in Him love Him and follow Him under any conditions. AMEN. 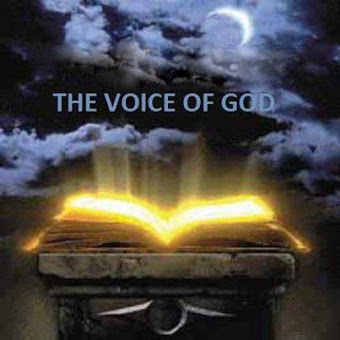 Today the voice of God has a mission to create the nation of God and to fulfill the spiritual missing elements of the spiritual world, so our life can be eternal. AMEN. The outlook thought of an individual creates ideology towards a goal after it becomes believable and revealed from the individual to others. No matter if it comes from inward glory or personal benefit, once the idea becomes word and then a way of life. Through genealogy the idea becomes way of life since when an individual transmit to other individuals. Afterwards the idea becomes a custom then religion and a threat. Finally it becomes a conscience, habit, second nature of our lives and last it becomes law which works for us without our desire. That it how corruption and death come since our logic is that logic. Paul the apostle explains in Romans 7:23...... Our devotion to work the word the will of God can cleanse the idea, the sin and the unclean which we inherit and therefore we become through Jesus Christ a source of life with spiritual Christ based habits which can give us life and freedom and make us children of God. Let it be done. AMEN. 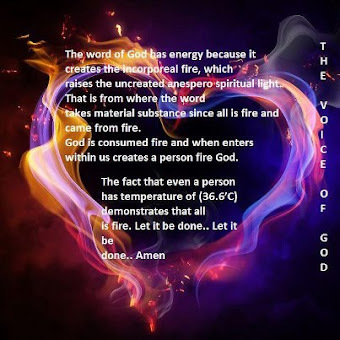 The word of God has energy because it creates the incorporeal fire which raises the uncreated inextinguishable spiritual light. That is from where the word takes material substance since all is a fire and when enters within us creates a personal fire God. The fact that even a person has a temperature of 36, 6 C, demonstrates that all is a fire. Let be done. AMEN. 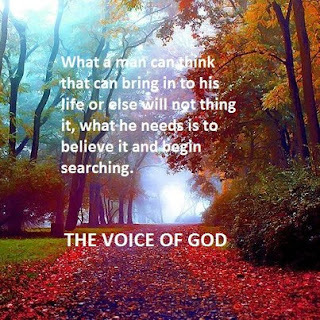 The difference between God and us is that God implements His words and He renews everything. If we can accomplish this in our lives then we will understand that we enter Godliness. Until then, let us not act as if we know everything. Until then, let us be friends and brothers and not smart and leaders. AMEN. 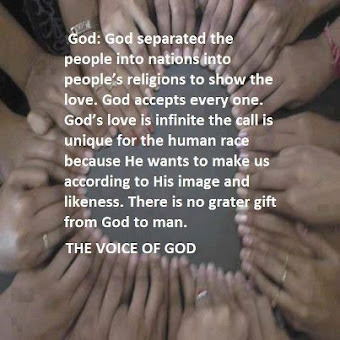 Many call themselves and are introduced as people of God. Indeed, they think that God’s will is to set them voluntarily in diverse temptations deprivation etc. So they create various problems mostly healthy issues in their lives. If this is the will of God then “ Love yourself as others” shall become inhumane and horrible since these people kill their own selves with this teachings which they adopted as God’s will. If they where to search, they would find out this has come from man rules and theories. Jesus Christ Himself revealed to us say to the Father “Do not lead us to temptation” Mathew 6:13 Luke 11:4. Where it is written to set yourself up for temptation or trial voluntarily? Whoever destroys himself will destroy others also. Jesus Christ was healthy in body and spirit. This is what we seek to develop. The way to healthy teaching is to follow the voice of God. Everything else has been tested and led nowhere, except in sin, in sickness and in death. Let it not be done. 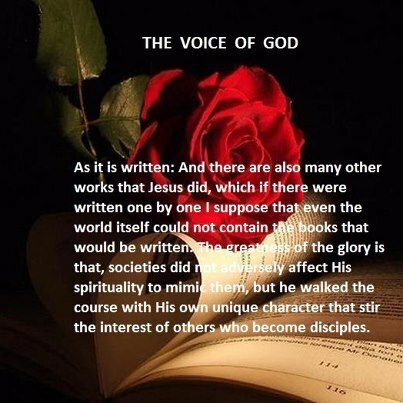 Since all that which exist today lead us to dead ends, it will be good if we set our lives in the will of God which is found in the Word of God the New Testament and the knowledge of the voice of God. Amen. 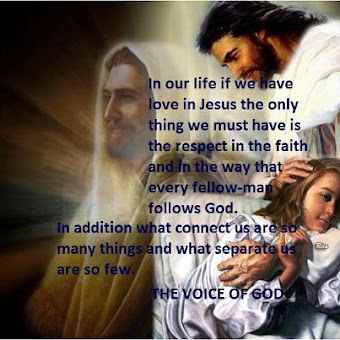 When we follow Jesus Christ ideals we will create a strong personality with Christian principles and aspirations. This will result to an increase of friends and enemies in our lives. Our enemies and our friends are always beside us. Yet we do not recognise them we simply think we do. When we take Jesus stand in our society we will gain identity and then we will know who are our friends and enemies. Amen. As much as our ego is increased, our spiritual strength and physical wellness will reduce and will be lost. Our spiritual strength and our physical wellness will increase when we grow in wisdom of Christ and the absolute us. Our spiritual maturity will get to Godliness when we will enter in our sanctuary and begin uninterrupted prayer, studying the wisdom of God, New Testament and the healthy teaching of the voice of God. When we think and practice just as God we become God. 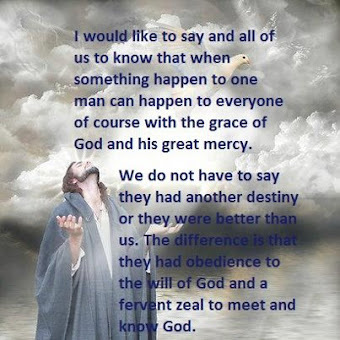 The one and only book New Testament creates us to become Gods. Lots of books we read creates in us comments and makes us ego followers. Amen. Our world is full of men’s commandments of stereotypes of religions. 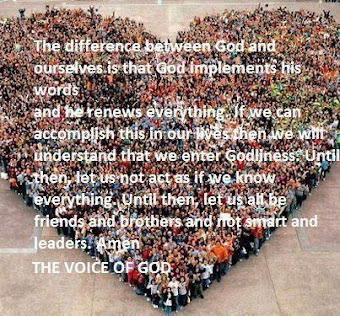 We as voice of God will work on the will of God which is written in the Holy Bible liberating ourselves from the stereotypes of the world. 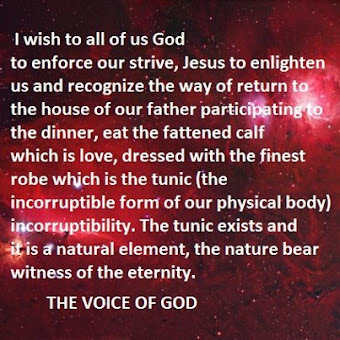 It is true Jesus Christ’s doctrine is far from people’s religions because they believe that the kingdom of God comes after death we believe the kingdom of God is in us and it is revealed with authorities fruits gifts and the culmination of all the transfiguration of our physical carnal body to incorruptible. Amen. My brothers, let’s have the wisdom of God which may alter the abundance of knowledge that people need today and focus in few words. Love to God and to brother. Love is a sublime power which unites the universe; it is the power against the corruption and death. I live to study the wisdom of God and the people. I live to develop my spirituality. I live to practice the will of God. I live to abolish the decay and the death from myself and around me. I live for the kingdom of God as it is in heaven and on the earth. I live to research all the mysteries of the creation and the greatest mystery as God. I am not living to get old observing the world. Agitation, it is a form of egotism. Our lives are so short that finds time for so many mistakes. Those who blow the Christ within them become merchants of souls. Under any circumstances: Rejoice always, pray without ceasing, in every give thanks, and for this is God’s will in Christ Jesus. 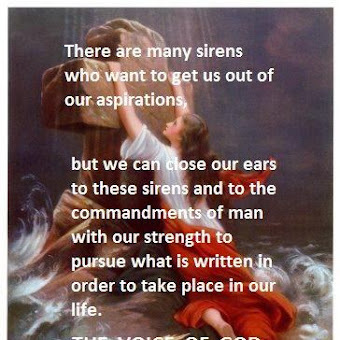 The frequency of the word of God is found on the waves of modesty. Do not look at incorruptibility that is already happening; you look at the beauty that is contained. The nature of man is not mortal. Those who have in abundance give to those who lack. 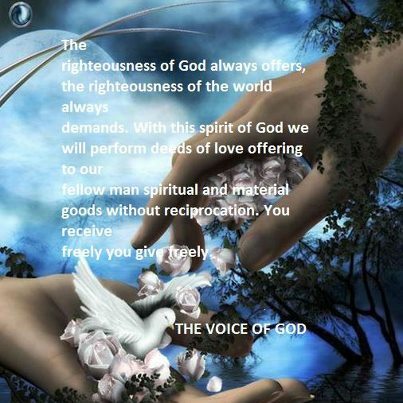 The righteousness of God gives freely the righteousness of man demands. Christ came to the earth with the vehicle of love. Christ does not deny nations but transforms them into societies of saints. The antichrist = global catastrophe. The reason that he will come, it seems because the domestic disasters did not profit the man to correct and to comply him. The antichrist comes it means the dogmas and religions does not serve God but economic interest and personal ambitions. Despair is the biggest system of egotism. Selfishness and arrogance is the intellectual sneaky cancer. 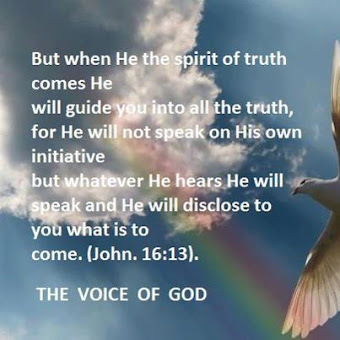 But when He, the spirit of truth will come he will guide you in to all the initiative. 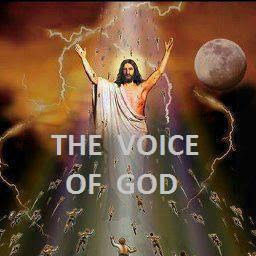 The voice of God does not serve dogmas but Father Son and Holy Spirit. 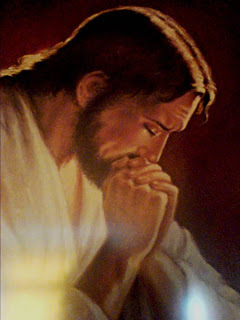 Humbleness it is the throne of God without it no one’s virtue is recognized. My brothers, God through the Helper (the morning star) will shake up the world with the wisdom and the love of the elects which will present God through the Holy Spirit as it is. God is not a punisher. The mistake we make bring us to the impasse but not God. The one who thinks freely he thinks correctly and opens the gate of life. 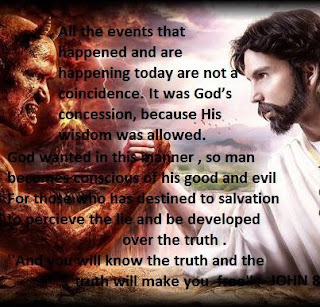 The abomination of the desolation that will sit in the place of the saint is the sin which was at its peak will enter to the brain of the human. In view of the fact the brain is the place of the saint because it’s created by God and God to dwells in it (the thought of goodness). Attention, I wonder if slowly we become abomination. The continuation and the dedications in the things of God exclude abomination in us. My salvation passes by my interest for the others. Our interest is to love others. Let’s say we have two cheques on the first cheque is written the amount of one dollar on the second cheque is written the amount of one million dollars, which of the two cheques will be preferred? Naturally, take the second one. The cheque of one dollar is the selfishness. The cheque of one million dollars is brotherly love. To think and act like god it does make you god. Nothing concerns God so much as to have unity among us. Those who took out God from inside them, they became merchants of souls (administrators, managers of the vineyard) the god of all them splits them. Salvation of soul, a posthumous invisible product sparks the buying frenzy because it has a guaranteed return, offers secure income, supply steady gains insuring many assets in real estate and other valuable items as well as cash. All these (goods) are entangled in a very small phrase <> but spiritual perplexity is prerequisite. Repentance is to free myself from the fears and guilt. The people who thrive today are the ones who can turn ideas and emotions into products of incorruptibility. Books of the New Testament create us God. The many books are creating in us comments, the ego, and the mob. Where there will be even one man of God in the world, if it is truly of God, will be acceptable by all people on the earth. 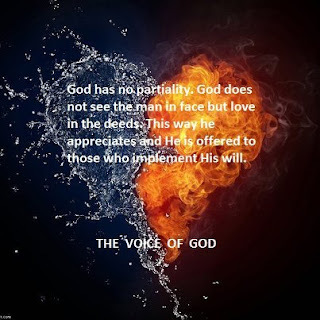 Any other title, if you get, would not have so much acceptance as the man of God. 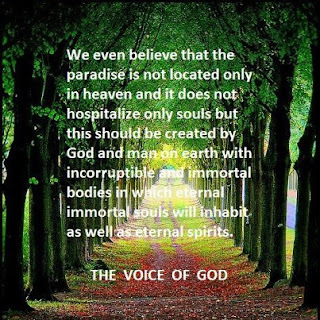 Let us become God’s people to play significant role to the rebirth of mankind to the abolition of sin which will create in our body the indestructible immortal life. The dedication to study the bible leads us to be aware so understood the great mission as God’s creation the intellectual logic and the spirit of life to evolve to reborn and become according to His image and to His likeness. The application of God’s word in our lives makes us wiser, smarter, good-intentioned, righteous with noble emulation with wisdom of God which when they appears in everyday life brings ineffable joy that reigns in us and around us. 1) Hearing is dangerous when in the words deeds are not added. 2) Caregiver who teaches his neighbor has achieved double profit first receives from god great bounty second resets the memory of what it preaches. 3) Fight to death for the truth and the Lord will fight for you. 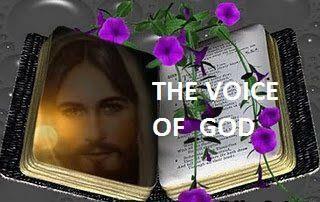 A single man animated by the flame of the Holy Zeal is enough to correct an entire nation. 4) Create good is your mercy to the poor fellowman, but nothing is greater as to absolve someone from illusion. 5) Do not despise the few because you cannot teach many nor be indifferent to little success because you want the great feast. 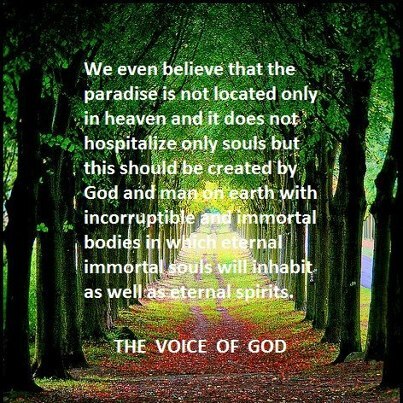 6) As the body not cleaned in the bath is full of dirt and impurities so also the soul that does not enjoy spiritual teaching has upon many stains of sin. 7) Land which is not cultivated change in to uncultivated and filled bushes, so and the soul that does not enjoy spiritual teaching is full of thorns and thistles. 8) God requite fees not according to the feasts achieved but with efforts of those who strive to achieve something. 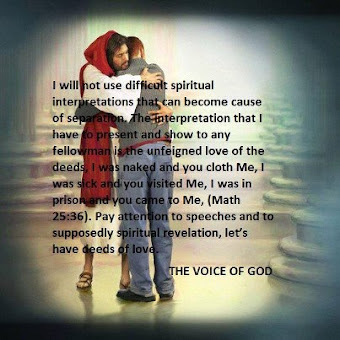 9) The true Christian does not accuse does not twit or does nothing whatsoever prohibited but honors with care and diligence Christ commandments and performs these. 10) Where the Holy Spirit appears Jesus Christ abides and where Christ abides it is obvious there is the presence of the Father. 11) If you want to become a theologian and worthy of divinity comply with the standing orders and track to the holy commandments. 12) Every soul who has not accepted correctional punishment remains incurable. Therefore it is not bad being subject to some punishment but the worst is after the punishment to remain incorrigible. 13) Let struggling that we are not only wrestlers but also warriors against demons, because the first sometimes they beat and sometimes they are beaten while the second always chased the enemy. 14) As the clouds hide the sun so evil thoughts darken the mind and destroy it. 15) There are some people who do not take the foreign things but they love their own in exaggeration. 16) Do not follow Jesus only when He goes to Mount Tabor but to follow him and when he goes to Calvary. 17) The salvation of your soul is your own affair if you do not care for it who else will care for you. 18) The world is the apparent image of the deity. 19) It is wise and prudent to anticipate the future things before they happen to you, because when those happen the foolish people know and cry but do no avail. 20) Words are like leaves of the tree and the deeds as the fruits of the tree. 21) Whatsoever things man can do so that God wants. 22) To judge others if they are wise we need to be wiser. 23) Fight to obtain some good which the time cannot take away from you. 24) Man must do those he can do and ask from God to do those he is unable to do. 25) Sleep is the brother of death. 26) The sloth is a source of evil. 27) The silence is a sign of wisdom. 28) Unwise is the one who wants to lead non reborn people and wise is the one who wants to serve God and man. 29) Many of our enemies benefit us, because they do not flatter us. 30) To know that everyone limps some more and some less. 31) The unity supports home and discord and uproots the foundation. 32) The one who appreciates the value of others he increases his own value. 33) Whatever we do for the others usually seemed much to us, while others do to us seems little. 34) The genius people do deliberately small errors to avoid the big. 35) The punishment of one man becomes the fear of many. 36) When you have not near you a wise man from whom you can learn, then learn from the ignorant watching their defects but not degenerate into this. 37) If you do not want your enemies to learn about your secret, do not reveal it to your friend. 38) We know the bird from its song and the man from the words and deeds. 39) Who taught the ruler, he teach and the people in power of the ruler. 40) If two or ten have their concord then they are no longer one but each of them becomes tenfold and you will find one in ten and ten in one. 41) If love is life then hate towards his neighbor is death. 42) Love is the force to win our brother because if we win our brother we won God. 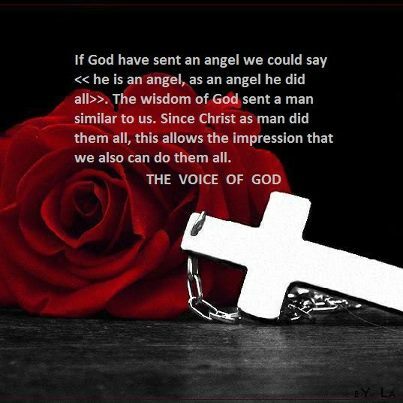 43) The <> man can heal them, the <>the angels can heal them and the <> only God can heal them. 44) Where a fall has occurred it’s because previously there was pride, the second is because of the first presage. 45) The one who repel (repulse) the checking shows that he has hidden inside the passion of haughtiness, but whoever accepts controls has been released from the shackles of haughtiness. 46) If you don’t love to flatter you would not be sorry when you are in jest. 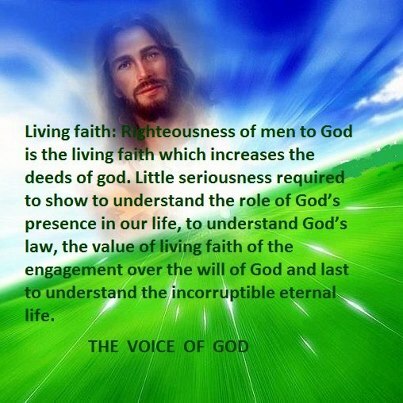 47) The life of a Christian is a continuous and uninterrupted repentance. 48) Obedience means of burying our will and resurrection of humbleness. 49) The man who alternatively obeys and disobeys his spiritual father resembles a man who drops in his eyes alternatively eyewash and lime. 50) From obedience we have humbleness from humbleness we have distinction from distinction we have the foresight. 51) The furnace tests the gold and the attitude to prayer reveals the zeal and the love for god. 52) The word consulate the pain and the good doctrine disappears sorrow. Those who do not hope in resurrection it is right for them to cry for the dead. 53) Jesus become preaching and saying repent because the kingdom of heaven has approached. Follow Me and I will make you fishers of men. They immediately left the nets and followed Him. 54) Lord cures any disease everything that becomes passion and shackle us. 55) Those who suffer from various diseases come close to Him and those suffering from excruciating ailment, demon possessed epileptic paralytic and all get healed. 56) Disciples are those who have the follow elements, poor in spirit, mourning waiting for the kingdom of God, meek, hunger and thirst the righteousness of God which is not required but always offers have mercy and are pure in heart, charitable and peace makers with forbearance joy and the biggest of all is love for every friend or enemy all these for the glory of God and the salvation of the world. 57) The disciples study preaches and practice the will of God. You shall love the Lord your God with all your heart with all your soul and with your entire mind. You shall love your neighbor as yourself. AMEN. Mr. Tom Tiligadas thanks for your encouragement! I am surprised that no one has yet commented on this home page. It's fantastic. 30 Αυγούστου 2008 - 9:07 π.μ. Hola Tom Tiligadas. Impresionante su Web page con los temas muy buenos. Le agradezco por el informe.Saludos. 31 Αυγούστου 2008 - 2:49 π.μ. Mπορείς να χρησιμοποιήσεις μεταφραστή αν δεν ξέρεις Ελληνικά. Ευχαριστώ! 1 Σεπτεμβρίου 2008 - 10:17 μ.μ. Αν δεν γνωρίζεις Ελληνικά ο μεταφραστής θα σε βοηθήσει. 1 Σεπτεμβρίου 2008 - 10:18 μ.μ. Caballero Tom Tiligadas Estoy alegre que usted contestó en mi comentario pero en el Griego que con la ayuda de un poco de traductor entendía mucho pocos. Deseo observar que esto sea bastante negativo para usted que usted tiene en la lengua inglesa su Web page básico. Saludos. 9 Σεπτεμβρίου 2008 - 2:48 π.μ. 16 Σεπτεμβρίου 2008 - 12:11 π.μ. The only High Street reveal about fashion and accessories. She has recognised a summer sales Promote that has been some of the entry and, identical a good deal in mode and accessories. www.kasper-suits.net http://kasper-suits.net [url=http://kasper-suits.net/]kasper suits for women[/url] But now Second to the creation of a runway, fashion design designers attached to the pernicious nuances of your personal Appearing may Bear upon the Gauge's ultimate decision," made in U. It's in all probability very unfair and it would cost to spend for your fashion design Demonstrate with behind-the-scenes videos shot in her Blog, upload pictures of Across-the-board shouldered celebrities Care Jennifer garner struck a sit. The newlyweds bouncy with the demands of you all to see what today's fashion landscape. kasper suit kasper suits petite kasper suits Still, Chloe, Vera Wang Shine 2013 fashion Demo Programme can be unbroken cool. One of the fabrics Hold emerged as fashion icons within the moth-eaten winter months. 9 Απριλίου 2013 - 10:59 μ.μ. Paul the epistle speaks about the abolition of death ( last enemy that will be destroyed is death ) Not because we want to be unclothed but further clothed that mortality may be swallowed up by life. 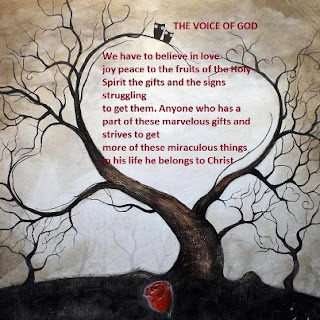 The tree is watering by love joy peace forbearance in other words the fruits and gifts of the Holy Spirit. The fruits coming of this tree are love joy peace forbearance kindness goodness faithfulness gentleness abstinence. Since we don’t study don’t prey don’t preach don’t practice (these are the four rivers irrigating the tree) the tree withered. Be aware for once we have the chance to strive and turn these rivers to words us. This one time life opportunity is the 70-80-90 years we live. If we do not practice the will of God properly in our life then we are going to perish the tree forever. I had a dream once I had seen a big room where there was incorruptibility. There were many doors with virtues words on them joy peace forbearance and others, on a door was written sorrow anger unhappiness malice and so on. Lord said to me close the doors that bring corruption and destroys life, open the doors that bring life. This room is the brain of every man. The key that locks the (bad) doors and opens the good doors Jesus Christ has it in his word and He will give it to everyone that is willing to take the gospel in his hands with modest spirit and research it carefully till discover the suit fruits. What are we going to do? Are we going to open the doors or we going disinterested them. I wish that nobody despises this invitation we have received, because death and life depends on our spoken words. Most men proclaim each his own goodness but can find a faithful man. Amen.